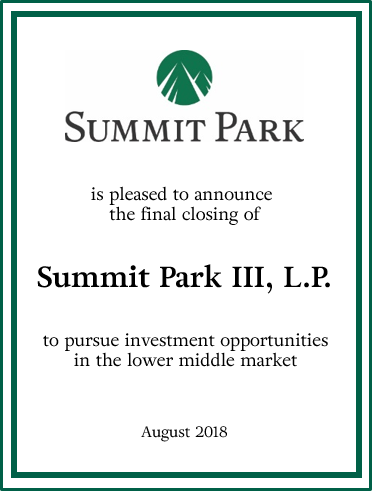 Summit Park (“SP” or the “Firm”) is pleased to announce the final closing of Summit Park III, L.P. (“SP III” or the “Fund”) at $245 million. The Fund exceeded its original target of $200 million. Limited partners include all of the predecessor fund’s investors, as well as the addition of several new institutional investors, including pension funds, foundations and asset managers. SP III will continue the strategy of the Firm’s predecessor fund, Summit Park II, L.P., which closed in April 2015. Investment interests will be oriented towards lower middle market companies with $4 to $15 million in EBITDA located in the Eastern half of the United States. Morgan, Lewis & Bockius LLP served as legal counsel to Summit Park.